Happy Wednesday everyone! It has officially been Fall now for a while but it is so hard for me to get in the spirit when it is so stinkin' hot outside here in Florida still. I mean like tank top and shorts kind of hot still. 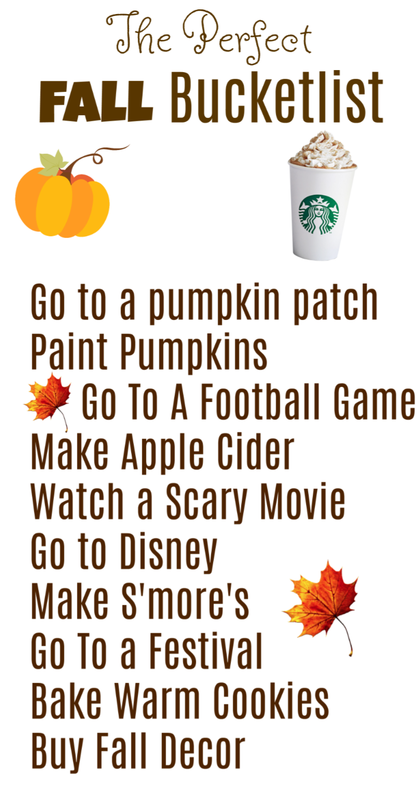 I figured it would be a good idea though to make a Fall bucket list for myself for when it does get a bit cooler.. if that day ever comes. One of my most favorite days last year was going to a pumpkin patch with my sister while wearing plaid, sipping hot coffee, and listening to country music. I definitely want to do that again this Fall! Last year I tried carving a pumpkin for the first time and realized it wasn't my thing. It stunk and was yucky (lol!) so I decided that painting them was probably more my thing! I want to paint several and use them to decorate my room this year. This one sounds silly but I am usually too hot to last during a whole UCF game, especially one during the mid-day. I would love to go to a night game during late November though and wear my big UCF sweatshirt and cheer on my school!! I am not a huge apple cider fan but something about when there is a slight breeze in the air makes me crave it! I want to learn to make some homemade this year! I am the biggest chicken when it comes to scary movies and stay FAR FAR away from horror movies. I would however like to find one that is only a taaad scary to watch for a girls night. Let me know if you have any recommendations. This is something I can do all the time but they decorate so cute for Fall and I want to go and make sure to soak it all in. I don't have a fire pit so I am not sure how this will be possible but I will find a way. There is nothing that screams Fall like s'more's! I love all kinds of Fall Festivals and going on hay rides! I need to remember to find a local place that has it going on! I want to spend the Fall season perfecting my cookie recipes and giving neighbors and family warm cookies every now and then. I absolutely love going to Target and Michaels during this time of year and seeing all of the decorations. Not that I need any reason to shop but this season sure will make it extra enjoyable! Well that pretty much covers my Fall bucket list for this year! What are some things you absolutely have to do this time of year? Let me know your favorite scary movie!